I was just reading about things in general when something just dawned on me: SOLVER will solve regression problems. A whole variety of regression problems. To prove that, I build a series of models using SOLVER and found that it is true. 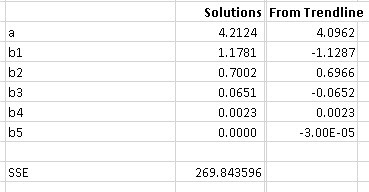 Jut when you think it’s a waste of time to learn yet another regression technique, SOLVER will solve your simple regression problems, your logarithmic, power, exponential and polynomial problems. 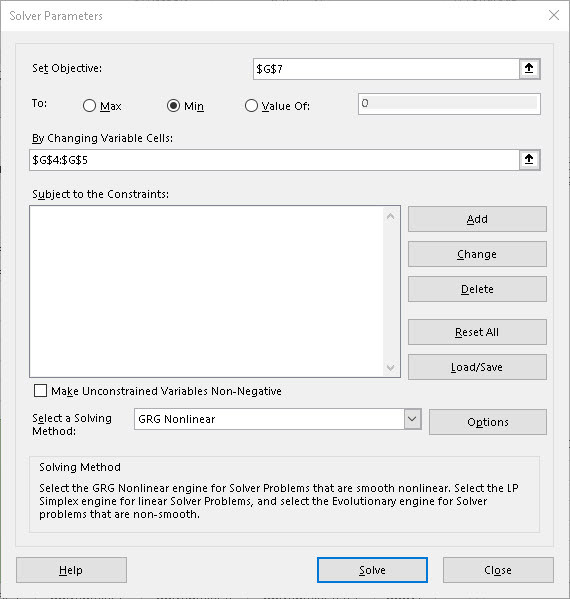 To use the SOLVER method you set up your model and enter estimates for the answers you need. Then you run SOLVER and that’s it: done! The best thing to do is to illustrate my ideas with examples. Set up the worksheet as you see below and program the Predict Y column to feed off the range G4:G5. This means, cell C4 contains the formula ==G$4+G$5*A4 which you fill down to C13. In cells G4 and G5 enter your initial guess … try to make an intelligent guess but don’t worry if you are wrong because SOLVER will find the right answer for you. I went to the web site you can see in the following graphic and worked through the example you see there. This relates to a non linear example and the regression equation in C5 is =G$5(1-EXP(-G$6A5))+$G$7, using the EXP() function. Otherwise, look at this example in the file you can download from the link below and make sure it works for you. A polynomial example now but with two parameters held constant. Again, work you way through this example and by all means, go to the web page that I also referred to and ensure everything is clear for you. Again you will see a graph here that confirms the goodness of fit of our work and again you will see an excellent result. By the way, examples 2 and 3 relate to scientific examples whose outcomes are predictable and reliable. I even prepared a model for training and testing data. This is not in the downloadable file you can see below but you can get it by asking me for it: it relates to the prices of second hand(used) Rolls Royce Cars. To run a training and testing model, gather your data and set up the model as with any other regression exercise. However, in my case I used the first 56 rows of data to create the training model and the remaining 13 rows of data for the testing model. To do this I just took the data from the source in the order that they presented it: I did not sorting or evaluation of any kind. If the data are fairly stored by the source, then the training model should be useful to use to make predictions for the testing data. 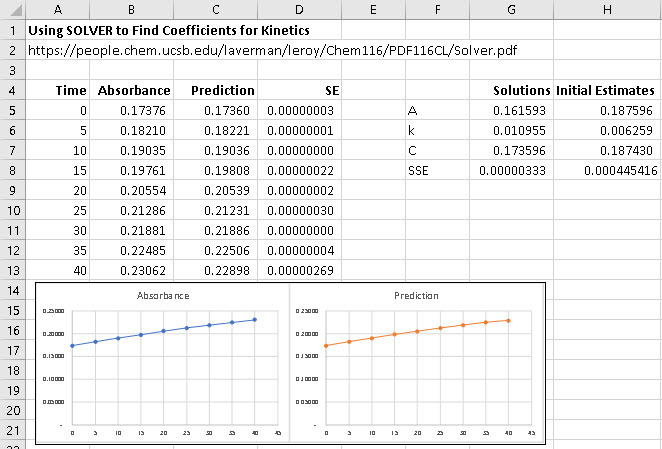 So, find your regression coefficients and apply them ONLY to the testing data. Evaluate your results! One way of testing the model is by finding the Mean Squared Error (MSE) of the model … the smaller the better. In my case the training MSE was much smaller than the testing MSE. There you are: try it and see what you find. Take my lesson, though; and ensure you verify any answers to a complex example by running the ToolPak and even the LINEST function as well as using SOLVER.